Luggage shipping is a service that allows you to send your belongings to a chosen destination. You may choose to do so because you are relocating overseas, travelling to university or college, going on holiday, or taking an extended trip, such as a gap year. Many of our customers are moving abroad and need to ship personal effects, like clothes, books, sports equipment and home furnishings. Gone are the days when hiring a removal van and driving across countries or even continents was the only answer. Gone too are the days when travellers had to rely on freight shipping to get their possessions from A to B. Instead of waiting weeks for freight to arrive, travellers can pack their possessions into suitcases or boxes and have them arrive at their destination within days. By sending their things with Send My Bag, they can instantly create a new home abroad and enjoy the familiarity of their favourite possessions. Send My Bag started off as a student luggage shipping company and we still send thousands of student bags today. Not only do students use our service to help them move to and from university and college at the end of each semester, but they also use us when going on a third year abroad, as part of an Erasmus scheme or a language assistantship. Travellers taking extended trips benefit from having all the things they need with them at their destination without the hassle of transporting it all themselves. 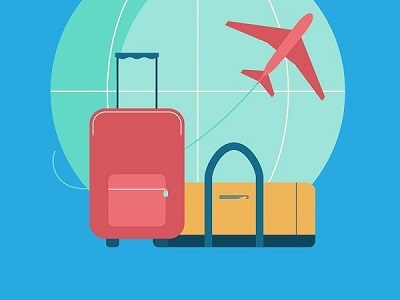 Travellers taking a trip involving multiple destinations can send their luggage ahead as they travel, making their journeys much more pleasant. That's why more and more touring musicians and sportsmen and women are turning to our service for its sheer convenience. Our luggage shipping service also allows travellers to use budget airlines without being affected by limited baggage allowances or being faced by excess baggage fees. How Much Does it Cost to Ship Your Luggage? The cost of shipping luggage depends on your collection country and destination country. It is very affordable to ship luggage with Send My Bag. To send a massive 66 lb/ 30 kg suitcase from the USA to the UK you would expect to pay $147 for the Express, 1-2 day, service. To ship between the UK and France, the cost for 30 kg is only £29 on the Standard service. To ship within the UK, you pay as little as £18 for 30 kg. Get your quick quote now! Is it cheaper to ship luggage? Yes, it is often cheaper to ship luggage, especially if you need to transport a lot of luggage. By shipping your luggage you can avoid your airline's excess baggage fees. Emirates, for example, charge a massive $30 for just 1 kg of excess baggage! If travelling with a budget airline, you will have to pay for any baggage you check, which can very quickly add up. If you are moving abroad, you might have considered using a removals company or paying to send your belongings by sea freight. These options can be very expensive. If using a removals company you have to pay a premium to have a van and driver specifically transport your belongings across long distances. If you send your luggage with Send My Bag, your items will travel on an extremely efficient network that uses delivery vans and drivers available across the globe. Inevitably, the cost to you will be much lower! If you choose sea freight, you may get a good enough deal, but you will have to wait weeks for your items to arrive at port, and then will have to work out how to get your items to your final destination. You may also have to pay an agent to get your items through customs. At Send My Bag we deliver door to door and we advise you on customs every step of the way. It’s easy to choose a luggage shipping service – just go for one that won’t be beaten on price and that guarantees express service items will arrive on time or your money back! Send My Bag has a proven track record of getting luggage to its destination on time and in tact! So you can rest assured that your luggage is in safe hands. We have a dedicated customer service team ready to answer any questions you may have and to make sure your luggage sails through customs. On our website you can find information on every aspect of luggage shipping, from shipping suitcases, to shipping sports equipment, like golf clubs, bikes and skis, to student shipping. We also have an extensive FAQ section answering many of the questions you might have. Our blog offers support and advice to our customers who often use Send My Bag during notable times in their lives, such as moving abroad, heading off to university or returning home after a long stint overseas. Given Send My Bag’s price guarantee, you need go no further to find the cheapest luggage shipping around. So get your quote now! Students can also benefit from Send My Bag's student discount. To avail of this offer, all you need to do is enter your Student Advantage, NUS Extra or ISIC number when you register for a Send My Bag account. If you don't have a student card, you can join #SMBStudents and enter the code you receive to benefit from student discount. See our Student Shipping Page to find out more. If you are wondering whether to send your luggage or just check your bags, you should bear in mind that it can often be cheaper to ship your luggage than check it into the hold. Find out how much it would cost to check your bags with your airline, taking into account the cost of going over your baggage allowance. If travelling with a budget airline like Ryanair, you may find that the cost of your flight increases dramatically once you have included all those basic 'extras' that such airlines like to charge for. Ryanair are now charging to bring anything more than a small handbag on board their planes, so it pays to do your research. Aside from saving money, by sending your bags ahead you also get the luxury of luggage-free travel, which means you don't have to fork out for a taxi to transport all your luggage or struggle to drag multiple suitcases onto public transport. Send My Bag has 1000s of routes all over the world, to over 165 destinations, from the UK, the US, Australia, Africa, South America and many others. That's why so many of our customers use us to send their luggage abroad when they move overseas for work, when they retire overseas, when they study abroad or when they tour the world! Sending to international destinations involves satisfying certain customs restrictions and providing accurate information about a shipment to customs officials. There is no need to be daunted by this, however, as Send My Bag will guide you through the process of customs-proofing your shipment. You will find all the customs information you need to know about your destination on our Baggage Shipping Destinations Page. When you book your shipment, you will be given a breakdown of which documents you need to provide, and will be supplied with any customs forms you need to fill out. There is no need to worry about your luggage, as you can follow its journey every step of the way using the Send My Bag App. We also provide thorough advice on how to package and label your items correctly to ensure safe transit. This includes advice on packaging golf clubs, bikes and skis.